For the past couple of months myself and fellow freelancer Paul Ardeleanu have been working on designing and building a new tool for freelancers, contractors and independent consultants. 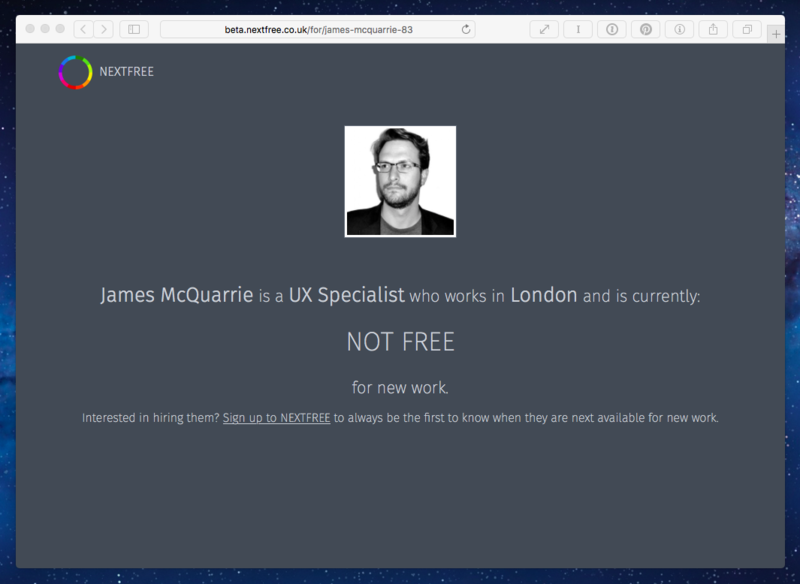 It’s called NEXTFREE and it’s designed to help freelancers share when they will next be free for new work. When you sign up for a NEXTFREE freelancer account we ask for a minimal amount of information about you. We only need to know: your email address, name, what you do, where you do it and when you’ll be next available. We then set you up your NEXTFREE profile in our system – this is searchable within our members-only recruiter area. Recruiters can search for people in a target location, with a particular skill-set and who have a specific availability.We return results ordered by availability. For example, when a recruiter searches for an London-based iOS Developer available on the 04 Jan 2016, we’ll show them iOS Developers in the London area with those that are free on the 04 Jan at the top of the list. We might still show unavailable iOS Developers, but they appear further down the list. The sooner you’re available, the higher up the list you appear. The longer you’re unavailable, the lower down the list you’ll appear. It’s then up to the recruiter to choose whether they want to contact you or not based on when you have said you’ll be available. Good recruiters will notice your availability and then look you up on LinkedIn / Twitter / your own website to learn more about your specific skills and what kind of work you’ve done in the past before contacting you (if they don’t already know you). We’re working on adding a feature that lets you link to your external profiles from your NEXTFREE profile to help encourage this. Watch this space. We also have a public version of your NEXTFREE profile that you can share with anyone you like. This version doesn’t show the exact date when you’ll next be free, but shows your availability as; “Free now”, “Free soon” or “Not free” – depending on how far out your NEXTFREE date is. The idea behind your public profile is that it gives you something to share with any recruiter or client who would like to keep track of when you’ll be available, but who don’t have an account with us. By updating your profile you don’t need to manually tell loads of people. Your privacy is of most importance to us; we’re working on a feature to allow you to toggle your public profile on and off, in case sharing publicly is not your thing. As well as providing a search tool for recruiters, we also allow recruiters to keep track of specific freelancers availabilities via a feature called Watch-lists. Recruiters can add freelancers to their personal Watch-list and then keep an eye on updates related to any freelancer on their list. So if you’re working with a recruiter often (and they have a NEXTFREE account), they will be able to add you to their Watch-list and know when you’re available, without having to email or phone you every couple of days. Our hope is that by using NEXTFREE freelancers and recruiters can work together to better plan and book contracts. If a recruiter knows you’ll be free in 3 weeks, they can plan better with their clients. If you can have a new contract confirmed 3 weeks before finishing current work, that takes away some stress of finding new work and reduces down time. To make this work, our biggest challenge is getting you to keep your NEXTFREE date current and accurate. But that’s our worry, not yours! We’re working hard on making sure it’s as simple as possible for you as a freelancer to use our tool and to keep your profile up to date. We’re also listening to all the feedback from our test freelancers and working on making sure that every NEXTFREE profile and set up is as unique as the freelancer who it represents. More on this in the future. If you have any thoughts or questions about any of what we’re doing we’d love to hear them. Drop me a line here, or get in touch via our twitter account twitter.com/nextfree.